NEW YORK (AP) Wilmer Flores flipped his helmet, crossed home plate and was mobbed by teammates after his tiebreaking home run with two outs in the ninth inning extended the best start in New York Mets history to 12-2. ”It was good just to get out of that cold,” he said. 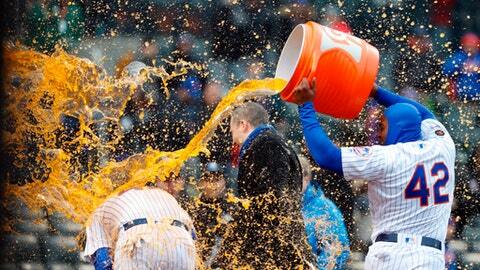 And then Yoenis Cespedes doused him with a jug filled with Gatorade and ice cubes. On a windy Sunday afternoon with a game-time temperature of 42 degrees – perfect for Jackie Robinson Day when all players wore that number – the Mets beat the Milwaukee Brewers 3-2 to open a season with five straight series wins for the first time. If only a runner had been on base, the score would have been, fittingly, 4-2. Rookie manager Mickey Callaway was down to one available reliever in his bullpen when the Mets came off the field after Jeurys Familia (1-0) worked around a walk in a hitless top half. ”Hey, win it right here and we get to go get warm,” Callaway remembered saying. As Amed Rosario stood by the on-deck circle with a royal blue balaclava covering his mouth and nose, Matt Albers (2-1) shook off a sign from catcher Jett Bandy, and Flores sent a belt-high sinker over the 370-foot sign in left-center for his second home run this season. Noah Syndergaard struck out eight batters in a row, two shy of Tom Seaver’s major league record, and Mets pitchers fanned 16 in all. Brandon Nimmo connected for a tying home run against Taylor Williams leading off the sixth and finished a double shy of the cycle. Syndergaard’s long, blond hair was flapping in the wind on a day when attendance appeared to be less than half the announced crowd of 26,036. Syndergaard needed 29 pitches to get through the first inning, then started his strikeout streak by fanning Oswaldo Arcia for the second out of the second. Todd Frazier’s RBI single in the first provided a lead, and Syndergaard was working on a no-hit bid before Hernan Perez singled to left on a 1-2 curveball leading off the fifth. Perez advanced on a groundout and stole third, and Bandy took a called third strike on a pitch that appeared low. Bandy barked at plate umpire Hunter Wendelstedt, and manager Craig Counsell came out to protect his only healthy catcher. Ryan Braun was on deck to pinch hit, a day after leaving in the fifth inning with back tightness, but pitcher Jhoulys Chacin batted and grounded to deep shortstop. Rosario snagged the ball with a dive onto the outfield grass and barely threw out the slow-running pitcher at first. Braun pinch hit with none on and two outs in the seventh and flied out. ”I have to plan for what could happen later in the game more than that situation with still 13 outs left,” Counsell said. Callaway faced second-guessing after Jay Bruce pinch hit for rookie catcher Tomas Nido in the fifth and was intentionally walked to load the bases, and Syndergaard followed with an infield popup that ended the inning. Callaway wanted to limit Bruce and Asdrubal Cabrera to pinch hitting to give them mostly a day off. Syndergaard had thrown 90 pitches at that point and was removed after 11 more. Jesus Aguilar singled with one out in the sixth, and Robert Gsellman relieved. Milwaukee loaded the bases when Frazier allowed Domingo Santana’s two-out grounder to roll under his glove at third for infield hit, and the Brewers took a 2-1 lead when Rosario bounced a throw for a two-run error after making a sliding stop on Perez’s grounder to shortstop. Syndergaard allowed an unearned run and two hits in 5 1/3 innings, with 11 strikeouts and one walk. He claimed the cold benefited his changeup. ”It kind of forces me to hold it more like an egg and allows my arm to be more whip-like,” he said. 1B Eric Thames winced after taking a 2-2 pitch in the first and was removed in the middle of the third after striking out twice. The Brewers said he aggravated a muscle in his left leg that had been bothering him and he is day to day. Milwaukee’s starting lineup already was minus catcher Manny Pina and outfielders Braun and Christian Yelich. New York’s Jose Reyes is hitless in 16 at-bats this season after going 0 for 4. Left-hander Jerry Blevins got Travis Shaw to hit an inning-ending grounder that left the bases loaded in the seventh. Brewers: Pina missed his fourth consecutive game with right calf tightness but might play Monday. … Yelich (right oblique) needs to have consecutive days of good workouts before he is activated from the disabled list, Counsell said. Mets: 1B Dominic Smith (right quadriceps) was recalled from his injury rehabilitation assignment with Triple-A Las Vegas, reinstated from 10-day DL and optioned to Las Vegas. Brewers: LHP Brent Suter (1-1) is scheduled to pitch Monday against visiting Cincinnati and RHP Luis Castillo (0-2). Mets: RHP Jacob deGrom (2-0, 3.06 ERA) is slated for Monday’s series opener against Washington, which plans to start RHP Jeremy Hellickson in his season debut.